This disc is the final volume in the Quatuor Danel’s CPO survey of the string quartets of this endlessly fascinating composer. If, like me, you are on the road to discovering his work and don’t yet know the quartets then be warned: after the opening bars of Quartet No. 2 you will want to acquire all the others as fast as possible. Weinberg has that effect on you. It is easy for critics to say of this or that composer that they were one of the greatest of their century and often difficult for the general public to accept when it is said of one whose name is still in the process of becoming widely known. However I sincerely believe that given time this accolade will be attributed to Weinberg with the general acceptance of the listening public. In a recent review I wrote that Weinberg and Shostakovich had “a similar musical language that came out of a shared experience both socially and politically, as well as an inherited understanding of their Russian and Polish traditions that involve certain mutual features”. I also wrote in another review that various Soviet and Russian-born composers seemed to have “an inherent and instinctive prism through which these composers naturally viewed things musical”. What I mean is that the music that comes from these countries is as easily identifiable as such because of certain features. The same can be said, for example, of French music; it is what makes many of their composers so immediately recognisable. It is features like this that often mislead people into thinking that Weinberg ‘borrowed’ from Shostakovich. This feeling is, I believe, only prevalent because Weinberg is the less well known of the two. I am convinced that time and further releases of Weinberg’s musical legacy will change that misguided perception. 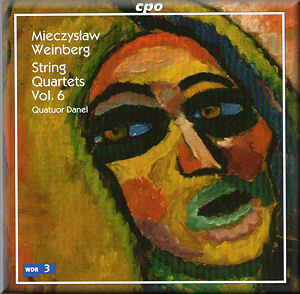 The second of Weinberg’s 17 string quartets was written in 1939-40 in Minsk shortly after his flight from the Nazi onslaught on his native Poland. It is dedicated to his mother and sister of whose fate he was then unaware. They had been murdered by the invading troops. With the obvious weight of worry about them on his mind it is surprising to find that this quartet has a very sunny outlook at the start. It begins with a skipping little tune but as Mr Wolf might have said to Little Red Riding Hood “all the better to surprise you later”. A more serious and introverted attitude is then introduced. At this point the contrast is more marked as a result. You can hear this in the slow movement which is reflectively plaintive with a note of nostalgia and regret. The Allegretto which Weinberg only wrote during his revision of the quartet in 1987, almost 50 years after its composition, forms a kind of bridge between the slow movement and the Presto finale. It is whimsical in its atmosphere. The finale is once again upbeat with a mischievous little tune that weaves its merry way to the quartet’s conclusion with plenty of plucking of strings to emphasise its playful nature. Even without its revision it was a very accomplished work for a twenty year old to have written amid all the turmoil of war and anxiety that he must have experienced as a young exile. The twelfth quartet, by contrast, was written in 1969 and completed the next year. It is interesting that Weinberg should be in an experimental phase so relatively late in his career but, as David Fanning’s excellent booklet notes explain, it pays homage to Bartók’s Third Quartet. The Weinberg is tonally bleak with a very stark opening that continues throughout the first movement. There is hardly any let up in the second movement either and we have to wait until its third before the mournful attitude is lifted with a more highly charged presto. The last movement, a twelve minute moderato is still fairly arcane in its treatment of the material though it is a little less unrelenting in its bleakness. Fanning indicates some interesting features to listen out for in what he describes as the ‘strangest movement’ of this quartet. The final quartet on this last disc in the Weinberg Quartets series is his last musical utterance in the genre. As Fanning explains it may have been the involvement in revising his second that led the composer to revert to his more capricious mood. The 17th quartet is a much more playful and happy sounding little 16 minute quartet with four movements of almost equal length. As Fanning explains it is one of the few of Weinberg’s chamber works to both begin and end on a positive note. This ‘leads us up the garden path, but towards light rather than Shostakovichian gloom’. In the music of Weinberg that I have heard so far there is none of Shostakovich’s bitterness which, it seems, was that composer’s outlet for his anger and frustration with the Soviet system. Weinberg, despite the many conversations the two must surely have had about the system and its oppressive and overbearingly controlling methods exerted upon composers to force them to write music that was “socially useful”, always had an admiration for the State. It had after all given him a safe haven which saved his life during the war, and for which he was eternally grateful. Whatever the motivation for Weinberg to choose to end his string quartet collection in such a positive mood what remains is yet another fine example of the richness of his ideas and his amazing ability to come up with new ones. This is music that is continually fascinating and beautiful. The fact that suddenly record companies are finally committing his music to disc is a continual source of joy for those, like me, who are discovering more and more of this composer. He is rapidly becoming known as the third great composer of the Soviet era alongside Shostakovich and Prokofiev. This disc is further proof that this position is well deserved.